There are certain swim workouts that will make a profound difference on how you look and feel. Swimming is one of the best exercises you can complete. It gives you a comprehensive workout to all areas of your body. It’s a rare combination of cardio and gaining muscle. 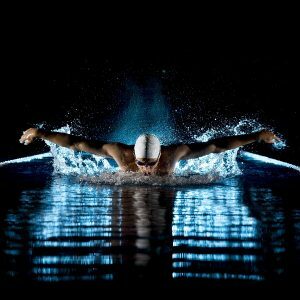 The simple act of swimming from one end of the pool to the other is technically an exercise itself. However, there’s so much more you can accomplish in the pool than just a typical lap. If you really take the time to perfect your swimming exercises, you can quickly develop a new physique. Not only that, but you can also easily help your long-term health. When you go through your swimming exercise, you should never stay stagnant. Always try to push yourself, and make it harder as you go along, and then come back down. There are certain swim workouts that will make a profound difference on how you look and feel. A sprint set is exactly what it sounds like: a low distance, high intensity workout with little rest. This type of workout is designed to make your body work harder. By going as fast as you can in a small amount of space, you’re exerting full energy, which in turn will make your body burn calories and fat at a quicker pace. It depends on how large or small your pool is, but make sure your intensity level is at 100% for these sets. The underwater dolphin kick is an important part of any swimmer’s form, and it’s something you should practice. Even if you’re not a professional swimming, it’s a routine that you should develop to help your workouts. Practicing your dolphin kicks will help you stretch out and loosen your muscles, increase the power in your kicks, and develop a more consistent feel while in the water. This is an underrated workout that helps you regain form while also making you train harder. The closed-fist freestyle is more difficult because it takes away the pull you’d typically have from an open-fist. Instead of propelling yourself forward with your hands and fingers, you instead have to rely on your forearm strength to complete most of the work. This workout helps you gain strength in areas that don’t receive as much attention. Sunrise Premier Pool Builders Is Ready To Help You! If you need the perfect pool for your home, Sunrise Pool Builders are here to help. We are happy to walk you through every step of the design process and ensure that your pool or spa meets the needs of every member of your family and all of the activities you want a pool or spa for. If you are ready to design the perfect pool or spa for your home, contact the experts at Sunrise Pools & Spas. For more information on our services, contact us online or give us a call at 410-349-3852. To see examples of our work, check us out on social media on Facebook, Twitter, LinkedIn, Pinterest, and Google+. This entry was posted on Friday, September 1st, 2017 at 3:37 pm. Both comments and pings are currently closed.